The University of California, Davis conducts regional trials in fourteen locations around the state to evaluate the agronomic performance of public and private small grains varieties. The results of these trials are summarized in the Commission’s Certified Wheat Seed Buying Guide, but the details can be seen on the University’s small grains page. The Small Grains page of the University of California’s website has a wealth of information, including Agronomy Progress reports, a Small Grains Production Manual, Pest Management of Small Grains, Cultivar Descriptions, and Characteristics of California Cultivars. 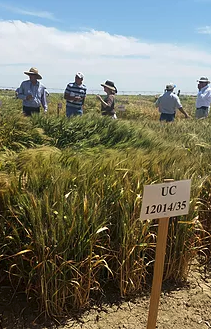 The California Wheat Collaborator Program provides an opportunity to evaluate wheat varieties being considered for release in the California market. Breeders are invited to submit their most promising varieties to be grown out in specific locations following agreed-upon agronomic practices. After harvest, Dr. Mark Lundy at UC Davis sends out samples to milling and baking quality labs around the country (including the Commission’s lab) to be milled and baked into bread or made into pasta. Then, in the Fall, all interested parties in the wheat value chain gather in Davis to discuss each variety’s performance. Agronomic data is also made available, but the focus is on end-use quality.